2 0 1 5 S E P T E M B E R P R I N T W E A R || 57 er's manual to find out the location and the frequency of oiling. Greasing is also equally important as oiling. Greasing is usually performed in longer intervals than oiling. 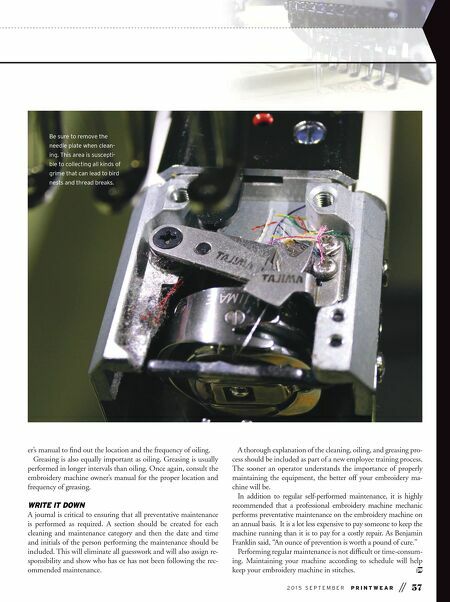 Once again, consult the embroidery machine owner's manual for the proper location and frequency of greasing. WRITE IT DOWN A journal is critical to ensuring that all preventative maintenance is performed as required. A section should be created for each cleaning and maintenance category and then the date and time and initials of the person performing the maintenance should be included. This will eliminate all guesswork and will also assign re- sponsibility and show who has or has not been following the rec- ommended maintenance. A thorough explanation of the cleaning, oiling, and greasing pro- cess should be included as part of a new employee training process. The sooner an operator understands the importance of properly maintaining the equipment, the better off your embroidery ma- chine will be. In addition to regular self-performed maintenance, it is highly recommended that a professional embroidery machine mechanic performs preventative maintenance on the embroidery machine on an annual basis. It is a lot less expensive to pay someone to keep the machine running than it is to pay for a costly repair. As Benjamin Franklin said, "An ounce of prevention is worth a pound of cure." Performing regular maintenance is not difficult or time-consum- ing. 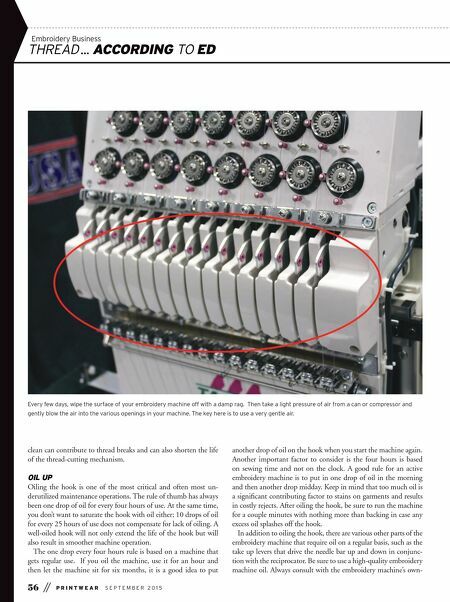 Maintaining your machine according to schedule will help keep your embroidery machine in stitches. Be sure to remove the needle plate when clean- ing. This area is suscepti- ble to collecting all kinds of grime that can lead to bird nests and thread breaks.